Imphal, Oct 18 : Manipur Chief Minister Okram Ibobi Singh on Wednesday said that Union Home Minister Sushil Kumar Shinde had sought his assistance to put to an end to six-decade-long Naga separatist movement, but he did not know if he could help. 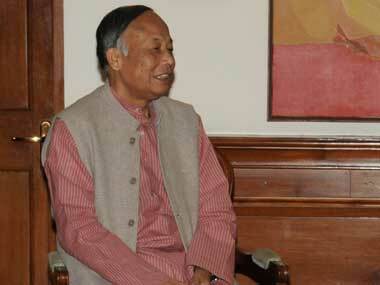 “The Centre has sought our (Manipur government) cooperation in solving the Naga issue. But I am not in a position to oblige, since the exact points of agreement between the NSCN-IM and the Indian government is not known to us,” Ibobi told journalists. The NSCN-IM has been fighting for an independent Nagaland for over six decades. It however later demanded a Greater Nagaland by slicing off parts of three neighbouring states to unite 1.2 million Nagas. The demand is opposed by Assam, Manipur and Arunachal Pradesh. New Delhi and the NSCN-IM entered into a ceasefire in August 1997. The two have held more than 50 rounds of peace talks to end one of South Asia’s longest-running insurgencies that has killed 25,000 people since 1947. “The Manipur government too wishes that the Centre and NSCN-IM come to an amicable solution and wind up the peace talks,” Ibobi said. The Manipur chief minister said that it was also too early for the Manipur government to comment on the Naga peace process as the points of agreement between the Centre and Naga separatist outfit have not been disclosed. On Tuesday, Nagaland Home Minister Imkong Imchen exuded confidence that there could be an early settlement to the six-decade Nagaland conflict. “We hope for an early settlement, especially since Home Minister Sushil Kumar Shinde showed keen interest in resolving the Naga issue,” said Imchen. The comments followed a published report that the NSCN-IM had decided to accept the Indian constitution and drop the demand for a Greater Nagaland. New Delhi’s main interlocutor RS Pandey, a former petroleum and natural gas secretary, did not comment on the news report but maintained that the peace process remained on track. “The peace process is on the right direction. I have held several meetings with them (NSCN-IM) but at the moment things are yet to concretise,” said Pandey. Nagaland Chief Minister Neiphiu Rio led a 19-member delegation of legislators, including opposition leader Tokheho Yepthomi, to meet Shinde and Leader of Opposition Sushma Swaraj in Delhi to apparently thrash out the final contours of a peace settlement with Naga insurgents. Rio, Imchen, Congress leader Tokheho Yepthomi and MPs Khekiho Zhimomi and CM Chang were among the 20 in the Joint Legislators Forum (JLF) who also met NSCN-IM chairman Isak Swu and general secretary Muivah. The JLF is scheduled to meet LK Advani on Wednesday in the national capital to seek support for an early solution to the Naga imbroglio. During earlier talks, the NSCN-IM had proposed “a special federal arrangement” to enable the Nagas self-governance, but the negotiations ended inconclusively. The NSCN-IM wants a special federal relationship with India, with a separate Naga constitution, and would like the guerrillas to jointly guard the international borders alongside Indian security forces.